Heart broken Kishen leaves home in his car, sees a few goons eve teasing a woman and trashes them. They overpower him and pin him to wall. One tries to stab him, but he kicks him and trashes brually. Other goons run away in fear. Woman pleads to stop, else goon will die. Family gets worried for Kishan. Sameer calls Agni as wife and asks to get his phone. Vasu says they searched everywhere and could not find him. 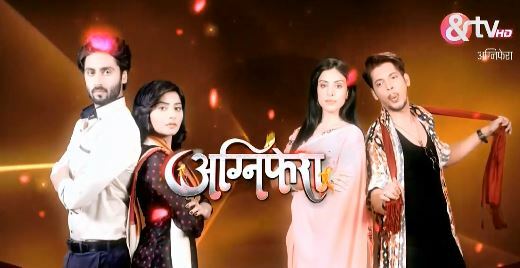 Vaishali blames Agni. Kishan stops her and says let losers yell for their loser son, let us go from here. He holds her hand tightly, and she resists silently. Yashi walks to Agni next and yells at her. Devi asks her to stop as Agni and Sameer did what they felt right, Kishan is not a coward and will return home. Kishan returns injured and stands seeing Agni and Sameer holding hands. Agni gets worried seeing his condition, but does not react. Yashi and Vaishali rush to Kishan and ask what happened to him. He walks away. Devi says Kishan is heart broken and marriage will heal his broken heart. She asks Sakshi to go and check him. Sakshi walks to his room with first-aid box. He asks why did she come, go away. She says she will after nursing his wounds, applies antiseptic lotion and feels pain for him. Kishan throws first-aid box angrily and cries he is unable to understand why Agni betrayed him, both sisters reconciled and Agni must have told her something, he pleads to tell what she said. Sakshi unable to see his pain runs away. Devi stops her and says she knew from before that Agni is untrustable, she is very ruthless, etc. Sakshi says she does not want to hear about Agni. Devi says Kishan needs her support, she should go back to him. Sakshi says Agni broke Kishan’s heart and now it is up to Kishan what he wants. Agni in her room sitting on her bed deletes her and Kishan’s pics reminiscing their love for each other. Sameer silently slips into her bed shirtless. She shouts. He shuts her mouth and says people will think they are celebrating suhagraat. She bites his hand and shouts to go and weaar shirt. He continues flirting with her, and she angrily sleeps on couch thinking it is better if she goes out Sameer says wheverer she goes, she will find him. Agni walks to balcony and sees Kishan drinking alcohol, scolds him to stop. He says why can’t he, show her right and throw it then. She warns to don’t be mad and throw away this bottle. Kishan says he always obeyed her as he loves her and wobbles. She asks where is Sakshi. He says he does not know, today is our suhagraat. Agni tries to leave. He holds her hand. Precap: Agni says she never loved Kishan and realized it after meeting Sameer. Kishan tells Sakshi that Agni betrayed him, he will expose her truth. He hugs Agni in dark. She thiking him as Sameer reminds him rule that he will not touch her. Kishan switches on light and Agni stands shocked.